Successful vitrectomy for eye floaters treatment is available at VMR Institute for Vitreous Macular Retina. Floaters are opacities in the vitreous body that appear as “hair-like,” “fly,-Like” grey structures that move with eye movement and interfere with vision. The most common cause of floaters is aging. The second most common cause of floaters is myopia (near-sightedness). Other causes include asteroid hyalosis or old blood – though both are less common. Most of the floaters that we remove at VMR Institute are due to a PVD, or posterior vitreous detachment. A PVD is a normal event and happens as we get older. Retinal tears can sometimes occur after the onset of a new PVD. The usual symptoms of flashes and floaters can be frightening. We recommend every patient who develops new flashes or floaters be examined for new retinal tears or retinal detachment. Retinal tears can lead to retinal detachment. Following successful treatment of retinal tears with laser or cryotherapy, floaters can increase. Floaters, by themselves, are not dangerous. 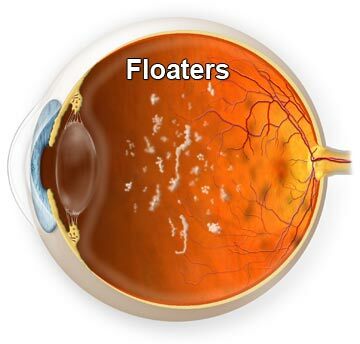 Care must be taken to ensure that the floaters are not related to a retinal tear, detachment, or another eye disease. In the absence of disease, floaters are benign. Studies have shown that some patients perceive floaters as a disease that severely impacts their quality of life. These patients have compared their floaters to more severe diseases such as diabetic retinopathy and age-related macular degeneration. We have discovered that floaters induce a significant reduction in contrast sensitivity, the ability to see shades of gray. This explains why patients with floaters are so unhappy and why they become extremely happy when we cure their floaters. What Is the Best Eye Floaters Treatment? Eye floater surgery (floater vitrectomy) has proven the safest and most effective way to get rid of floaters. This operation has been used for more than 40 years to treat a variety of eye diseases all around the world. Recent advances in surgical instruments along with a honed technique have allowed us to develop a sutureless operation that takes less than 10 minutes. Our vitrectomy patients are not hospitalized for this procedure, which is performed using local anesthesia. Using this minimally invasive technique, allows for the eye to heal within a few weeks. Complications of vitrectomy include infection, bleeding and retinal detachments. In 106 cases, we have had no infection or retinal detachment. We have only had one case of bleeding, which cleared spontaneously after two weeks. Chronic complications are cataract. This usually occurs in 80% of cases. Our operation was designed to prevent cataracts and thus we have only experienced this in 22% of cases after one year, and 40% of cases after two years. No one under 53 years of age has ever developed a cataract following floater vitrectomy. YAG laser has never been shown to be effective for floaters, which is why insurance companies don’t pay for YAG as a treatment for floaters. Also, YAG laser cannot be used for floaters close to the retina because it can damage the retina or optic nerve, causing vision loss.